Previously on Tea Brewers: Prime…or last time I wrote about the Fancun Tea market, I talked about buying a variety of quality tea from Messieurs Tian Bao Xiang, but the place is about so much more than just tea itself, and I was about to delve into the labyrinthine depths of the market. The shops surrounding the complex are equipped with well-lit traditional style shelves, displaying zisha or purple clay teapots priced up to thousands of RMB. Teacakes line the walls and assistants perch at counters breaking these up with tea needles. These traders are the petals on the flower, and make their money selling to those without time to explore properly. You really have to explore the inside of the complex, where sunlight filters in through tea dust, and the cool air carries the scent of floral infusions, clay, and fragrant woods, all subtly entwined with the ever present camellia sinensis. The front stalls of the main building sell mainly loose leaf tea in all six major varieties, as well as a dazzling array of art and flower teas. Towards the back and on the upper floors, the vendors begin to, and eventually only stock, extensive tea ware and implements. Apart from teacups and pots, you will be confronted with strainers, stoves, measuring spoons, picks, clips, brushes, trays, display stands, table ornaments, canisters, all the way up to the highly carved wooden furniture on the upper floor, where writing desks and side tables conceal hidden features to further enhance the tea drinking experience. It’s well worth a look, even if you have no way of transporting these ingenious furnishings home. The passages, which appear to be a simple grid, are blocked and buffered with stalls that branch out, making it quite hard to find your way to a specific store, or back to one if you’ve been ruminating over a purchase (pick up a card, or at least note the unit number). Stall after stall all display enticing, shiny tea sets that dazzle the eyes, decorated in calligraphy, mountain scenes, patterns of red, gold… the task of finding that one.. or maybe two.. okay, three at most…tea sets, can be rather daunting. As the Chinese believe in fate and that tea can help one get to a pure state of being, I would suggest that ancient practice of shopping, having a wander round, see which stalls you like the look of, and which tea sets find you. Every shop will try and draw you in, and whether it’s the exquisite Chinese archways, the giant teapot big enough to bathe in, or the amazing tea furniture carved out of a tree trunk that draws you in, eventually, you will find a set that you just know, is meant for you. We found so many different sets, and approaches to set making. 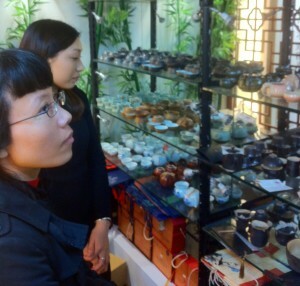 The almost phosphorous green of Taiwanese fine porcelain sat side by side with the zisha purple clay sets from Yixing. Modern glassware sat alongside stubby octagonal designs from the 19th century. We found one set on the attic of one shop, the outside glazed in rustic style dark silver, whilst the inside was left unglazed. We were shown one of the cups, which through use, had gained a cracked internal surface which was meant to “nurture” the flavour of your tea as you use it more and more. Fortune favours the brave at Qixiu, and whilst the market has its share of very formal shops, with expensive pre-packed teas, and “luxury quality” tea sets presented in lacquered pressboard boxes, good tea sets that are good value for money, are found in the corners of the market, or those shops which look much frequented, despite being so far into the maze. By far my favourite stalls for tea ware are Hua Long and Xiang Jiu Zhou. Hua Long is situated on the top floor, near the back of the building. A large stall open on two sides, the tea sets are displayed in their boxes on rows of simple glass shelves, which are so tightly packed, that my tall western partner, already laden with large bags of teas, felt nervous about walking through. A huge variety is on offer, for all pockets and purposes. Whether you are looking for a mini travel tea set, a functional porcelain set, or a clay set from one of the many established kilns around the country, or collecting the latest styles, you are likely to find it here, along with a selection of tea tools, tea trays, and even portable electronic stoves for boiling water. There’s a vague street market feel to the place, but you’ll reap rewards if you take the time to browse through the boxes. Jiu Zhou Xiang is situated on the back edge of the ground floor. Two halves separated by a few steps, and a display wall of teapots. Their range was not as wide as Hua Long, but they were beautiful, and very reasonably priced. I returned there because they had an excellent set of the draining tea trays, and I had fallen in love with one, made from phoenix tail wood, a tree beloved in Canton, if for no other reason than its red beans forming the staple of the area’s treats and desserts. The shopkeepers were good-natured people. Whilst their children sat playing counterstrike on the work computer, we talked and negotiated the price, becoming very open and friendly when one of them heard that my father is from Jieyang, also her hometown. It is an effort to track these stalls down again, but when our first chance meeting was so richly rewarded, I felt I wanted to make the effort. After half a day of browsing and deliberating, three sets had really stuck in my mind. A classically shaped set in the prettiest blue clay from Chaozhou; a set in black glazed clay from the same region, with a modern cylindrical design, had the most adorable bat sitting on the lid of the teapot, and three more forming feet at the bottom, making it resemble the 鼎 (ding), the ancient Chinese drinking cup; and finally an elegant set from a Fujian kiln. Light brown flecked with yellow and dark brown around the edges, the simple design and round, flowing lines of the teapots and upturned bell-shaped cups were timeless, and the curling cloud motifs on the lid and handle of the teapot, closely associated with 仙 (xian), Deity or Immortal in Chinese mythology. Only the limited space in my suitcase stopped me buying all three, and considering I was justifying this purchase to accompany my tea talks, where the tasting sessions required a complete quality set, I chose the third set, which came with a common pot, more cups and a good strong, two-tiered box for safe storage. The shopkeeper at Long Hua also recommended an exquisite lotus shaped glass strainer, to complete the set. Along with the tea tray, several kilos of good tea and a traditional set of bamboo tea tools gifted to me by my new friends at Xiang Jiu Zhou, we made our way back to Tianhe, mentally trying to fit it all into our suitcase.